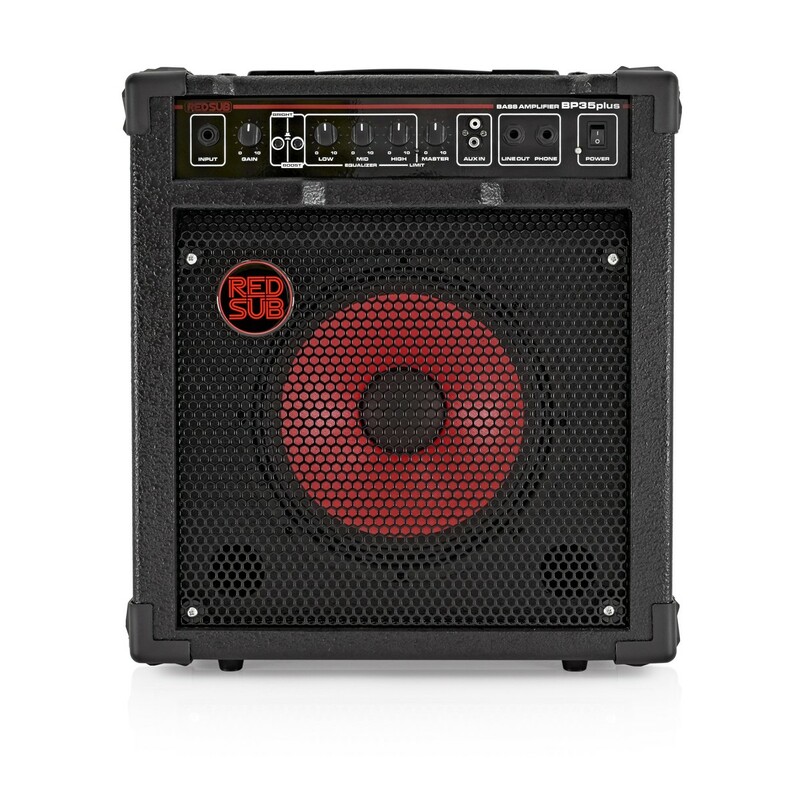 The RedSub BP35plus 35W Bass Guitar Amp features re-designed construction, with a sturdy cabinet housing a custom red 10" speaker. Rugged corner plates protect a control panel containing a 3-band EQ, line in sockets for a CD/ MP3 player and a headphone out for quite practice at home. 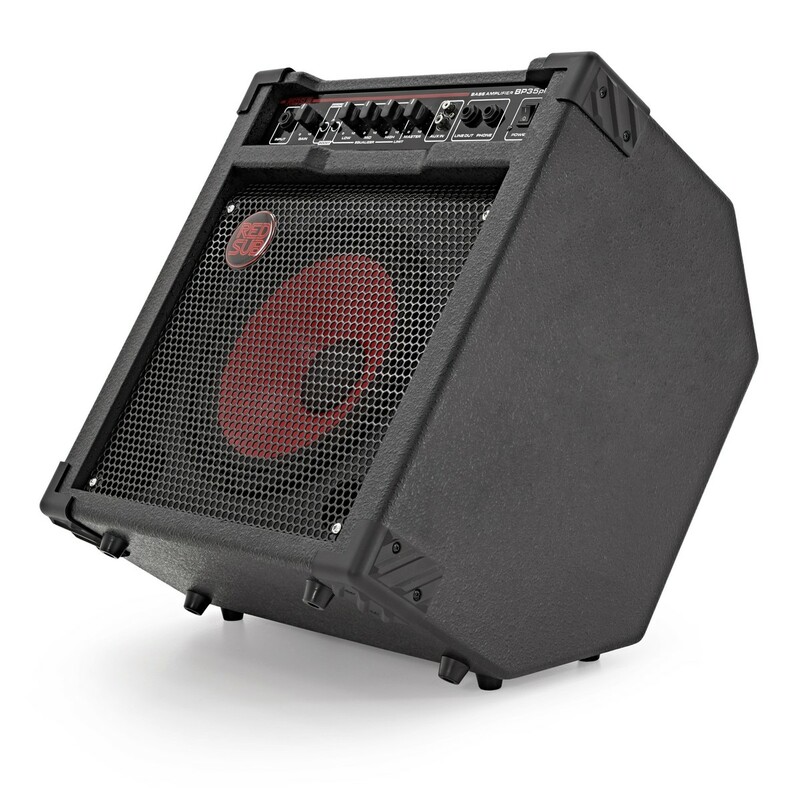 Packing a 35W punch, the BP35plus is perfect for practice and performing at smaller gigs. 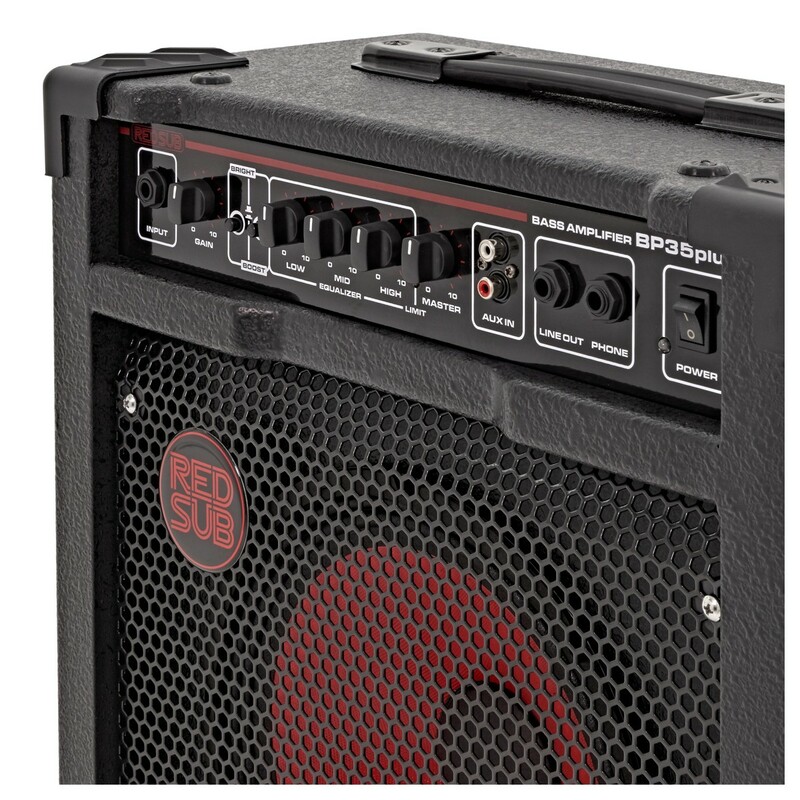 The RedSub BP35plus bass amplifier combo is an ideal practice amp. It provides the sound shaping options you need to produce great sounding bass tones, as well as a cd/mp3 input for playing along to backing tracks, and a headphone output for silent practice. 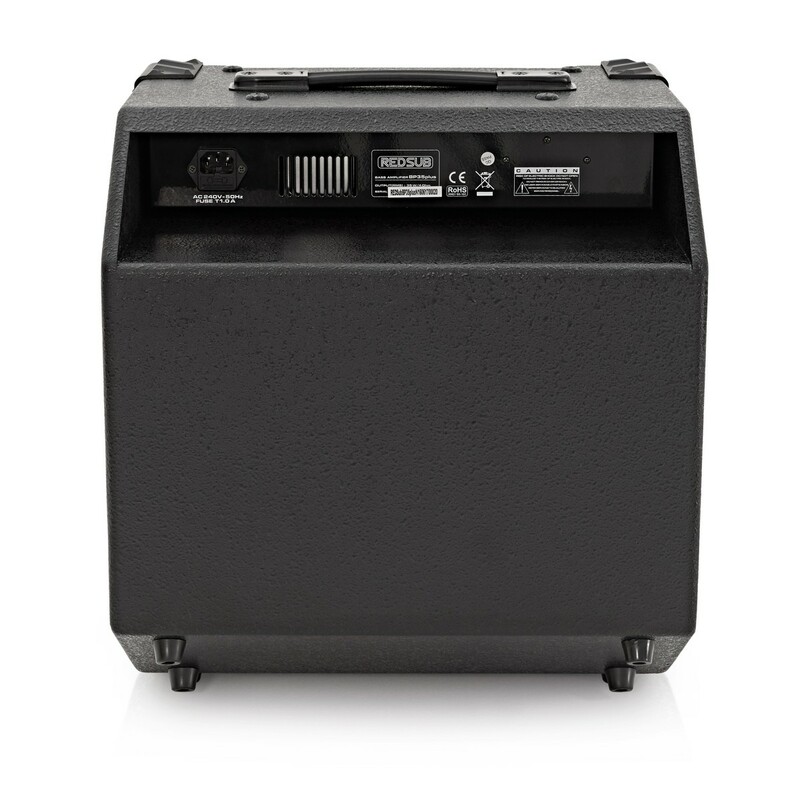 If you turn the BP35plus up, the 35W RMS of power will give you plenty of volume, and will be loud enough for playing small gigs. The 45 degree tilt back means that the speaker can be directed so you can hear it perfectly. It also features a line out, making it perfect for use in the studio as well. The RedSub BP35plus features a custom red 10" speaker, that has been specially designed to not just look great, but to sound great too. 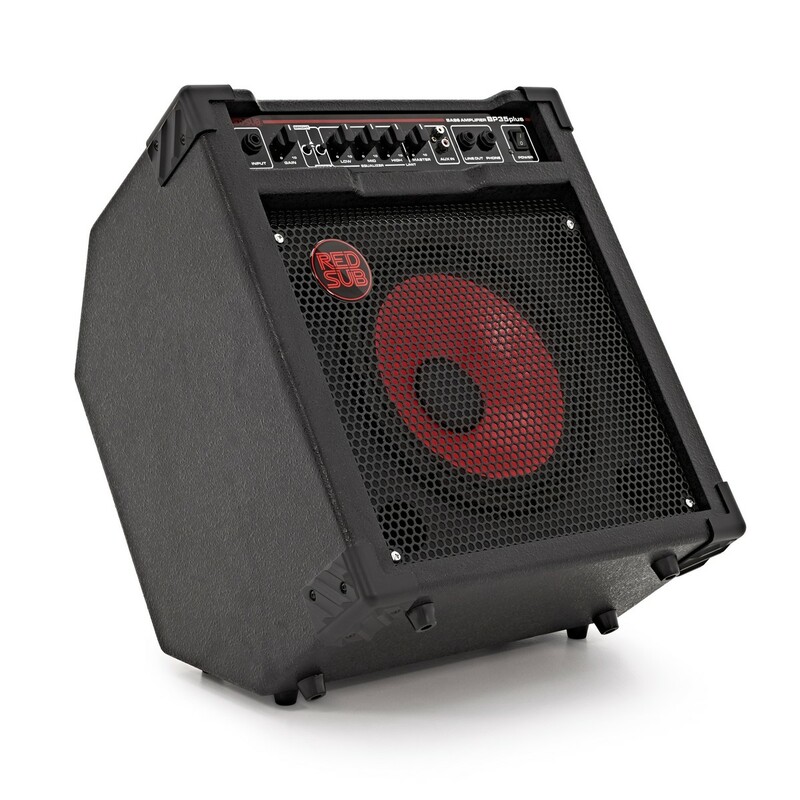 It delivers a warm and punchy sound that will cut through perfectly. The integrated limiter means that the sound will never break up, and there is no danger of damaging your speaker. Closed back cabinet design for a tightly controlled, powerful bass sound. Bright and boost switches for altering tone character and getting the best sound from your bass guitar. 3 band EQ for sound sculpting with dedicated Bass, Mid and Treble controls. Headphone output for silent practice and a line out for direct connection to PA and recording gear.